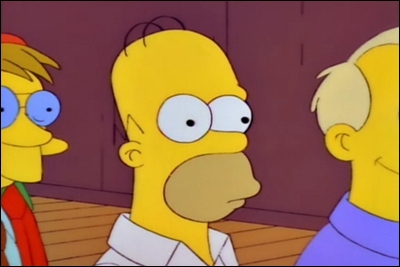 The "Dental Plan" sequence from The Simpsons possibly represents the greatest use of five words in comedy history. And if that overstates the case, at least consider that many of us have repeatedly gotten it stuck in our heads for over a decade without much complaint. Because it appears in my imagination so much, it winds up becoming an accidental soundtrack for lots of different things. It's easy to pair it with other things for a YoutubeDoubler. Anyhow, a bad case of writer's block sent me procrastinating on Youtube, and this happened. Click Homer to load.